Trying to organise a holiday is not rocket science, but it is complex. There are various permutations of mode and timing as well as lots of opportunities to save a bit of dough by shopping around. So I don’t understand how inserting a stupid person into the process makes it easier. Especially when that person has no understanding of your preferences, no special access to cheap airfares, and no stake in helping you make savings. When I was in there booking a one way flight (which I found on the net in advance), it took about half an hour. In that period I saw two other glum-looking customers. I only ventured in because I had come into possession of a voucher. I have no idea what unfortunate combination of ludditism or self-loathing drove the other two to be there. I also have no idea how they make revenues enough to pay for the red carpet and the bored young ladies. 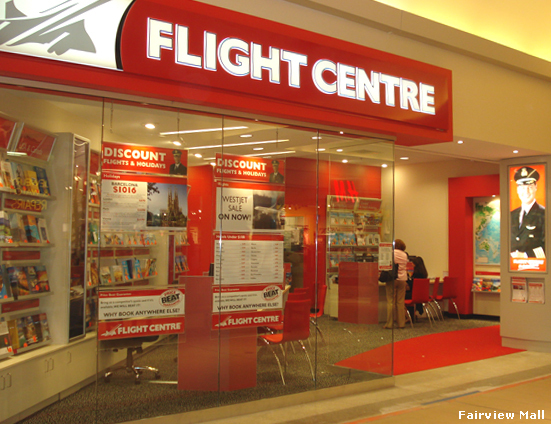 If you’d bought Flight Centre shares ten years ago, you’d have experienced aggregate share price growth in the low negative single figures! At this rate, some time next century Flight Centre’s valuation will approximate its business model’s true value. However, this is clearly not everyone: I recall a group of young, green-tinged lads who wanted to go to Russia, Mongolia, China (in exactly NOT that order) who would have been 8 shades of shagged without the help of Helen the travel agent. I remember you were green-tinged from eating rotten fish in Korea. I was the same beige hue I always am. remember, as I am in the ‘value’ game, I can tell you that someone must ‘value’ that stuff, the blonde girl and the bright shop fittings. If your value proposition is flight plus hotel plus car = $, then you can get all that value online, cheaper and quicker (and more accurately). However, if you want the ‘feel’ of being ‘special’ and tend to idolise your next holiday, and need the idea served to you, in a staged fashion, so you can ‘absorb’ it – this is what the travel agent panders to. Hence the glossy brochures (of the dearest holiday combination of its type), the little wallet thing they give you, the bag tags you don’t need, the excessive fussing over passports and visas, the overpriced vouchers for the meals in the hotel restaurant that could be had for a quarter of the price at the restaurant next door. To make you feel 5 days in Fiji isn’t a commodity, when it is. I’ve had the same experience at three different Flight Centres – completely uninformed staff, but found STA good. Into one city and out of another can be difficult and or expensive online. Otherwise I agree with the others – just had a fab trip to China with all internal tickets and accommodation booked online. Only mistake was going Qantas – how do they survive with such rude staff? A good travel agent is worth sticking to. Like a good doctor, good dentist or good hairdresser. When you find one they are invaluable. Yeah, sure the simple fly / drive package to NZ or flight down to Melbourne to catch up with the rellies is something you should do yourself. However I have to say that the really big trips like nearly seven weeks through North America is where people who know their stuff is invaluable for tailoring something that really meets your needs. It is also handy for getting in on some of those important air fare discounts for the long haul flights or big cruises. That is not to say that you can’t do a combination of travel agent and self help online bookings for some legs. I have done this with overseas domestic flights and some accommodation. My travel agent and her colleagues appreciate my feedback on my research because they appreciate what is useful and that I have spent a lot of time working on it. For those who do not have the time or inclination to put that sort of effort in, they should leave everything to their agent. But as I said before, make sure you hang on to a good agent when you find them. I was even prepared to wait until my agent moved to a new company after she was head hunted before committing to my last big trip. We have developed a great relationship over the last 12 plus years. Teedub, agree with your advice re a good agent. Question is, Fligth Centre ain’t it. What value proposition are they responding to? They seem to stay in business despite their limitations. Ricardo, the Flight Centre people might be relying on an illusion that they offer the cheapest flights. That was how they originally staked their claim in the market place but I do not think it holds true anymore. If memory serves me correctly they began as flight specialists only and moved into general travel agency work later on. However it would seem that they have not acquired or developed sufficient skills much beyond being simple booking agents. Several of these franchise chains seem to have adopted a supermarket mentality. Maybe it is kind of like the difference between buyers who look for quick and simple frozen meals and those who want the inspiration and best ingredients to create a gourmet delight. I certainly recall doing so, 20 years ago and pre-internet. It did cut through a lot of the guff you got from the previous generation of travel agents, eg Harvey World Travel. Some of them seemed simply unable to quote a cheap airfare without asking what other guff you wanted or opening their standard net fare books. I think their real ‘value proposition’ is just built up by TV advertising like the rest of the cartelised markets and oligopolists that run this economy. I prefer economies overseas where the hardworking guy in the small cramped office with the tatty fittings is in fact the cheapest, while the brightly lit shopfront is the expensive option. But our non-discerning population are too attracted to the latter, and this crowds out the former except for the persistent. I’ll let you in on a trade secret. If you want to go to somewhere in Asia, the Chinese resellers in the cramped and dingy upstairs offices around town can kill anything else on offer including the internet. The market is segmented by airlines like QF and CX around price sensitive VFR travel with the mainland Chinese airlines putting downward pressure. If the non-Chinese could put aside their prejudices they could save some money. Previous Previous post: How should we rank universities?